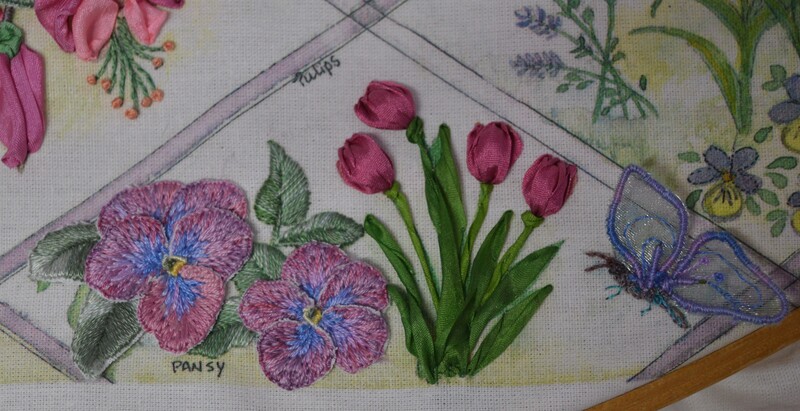 The next diamond to embroidery has a lot of stumpwork, which does take longer than silk ribbon embroidery, luckily I had a day at Skipton Embroiderers Guild when I could sit and concentrate on it for a few hours. We even had a TV crew there filming for a series, we’ve been sworn to secrecy but you never know, my flower lattice might just appear (albeit briefly!) on the TV…or then again it could end up on the cutting room floor! First to be tackled were the pansies. I stitched the leaves on the panel first, it got me back in the swing of long and short stitch and gave me chance to test the colours out. The petals and two of the leaves are all stitched separately on a spare piece of white cotton. I used one thread of variegated and one plain thread to get the subtle variation round the edges. The petals were edged with a long and short buttonhole first, which does give a nice firm edge. 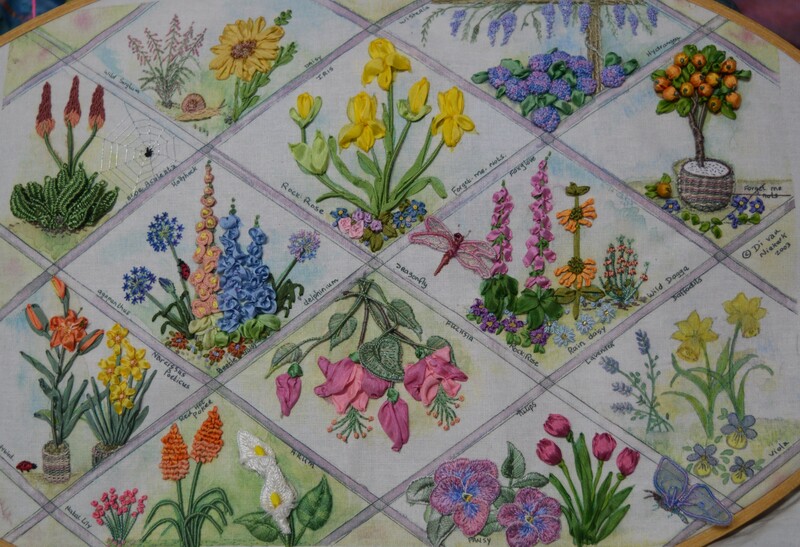 The leaves were edged with stem stitch which was then covered by the long and short stitch. Next came the nerve-wracking bit! I had to cut each petal and leaf out as close as possible to the stitching. I’m beginning to wonder why they always recommend white rather than say a soft green or grey, the only advantage I can see is when you try to trace it. The disadvantage with white, in my opinion, is that when the shapes are cut out it’s almost impossible to get it so close to the stitching that all the white is cut off. If it was embroidered on a softer shade, it wouldn’t show up half as much! I might try it another time! Stitching the shapes onto the panel was actually fairly easy, they’re just attached at the base so I keep the 3D effect. The centre was fiddly, three bullion bars in two different colours and a french knot in the middle in yet another colour! 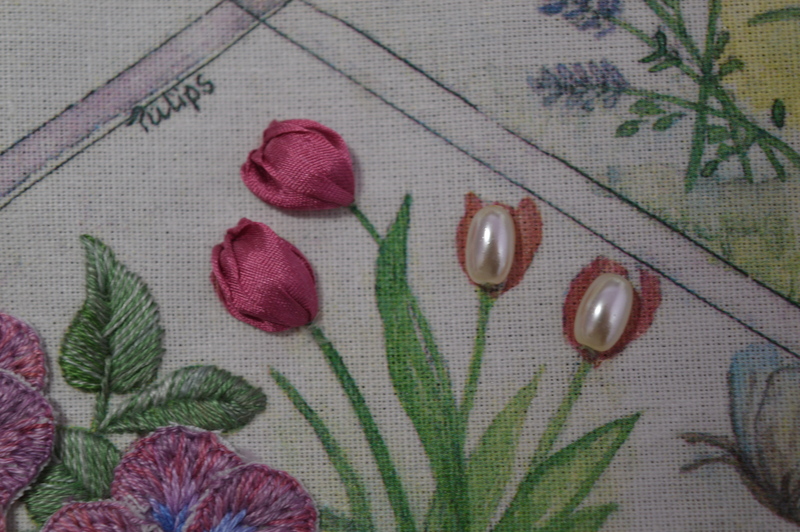 The tulips were interesting to do, they get their 3D effect by being stitched over little oval beads. I had some pearl ones in my stash that were just the right size. I used 7mm rose pink ribbon which I had in my box, it’s just several basic ribbon stitches overlapping to cover the bead. The leaves are just twisted ribbon stitch again, with a grab stitch to make the calyx. I used tiny stitches to catch the ribbon occasionally to give it the right shape. The final part of this diamond is the butterfly. The wings are embroidered on organza over wire. The wire is couched to the organza and then a little embroidery added. 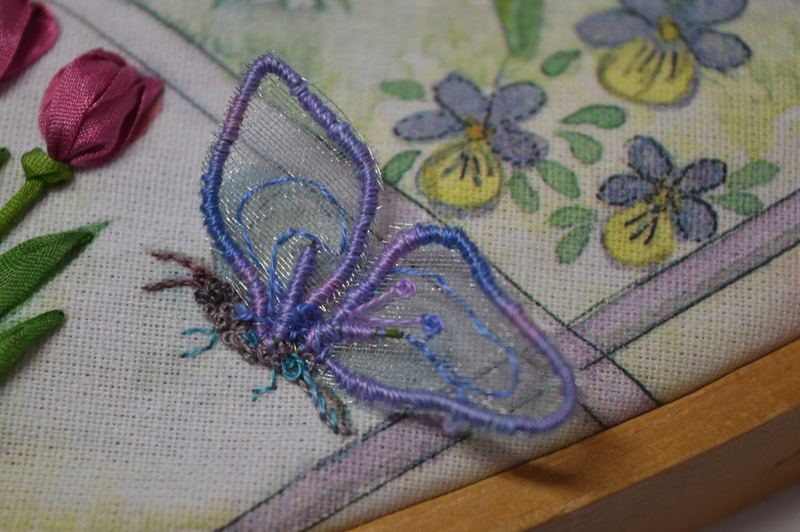 I actually stitched the wings a few weeks ago at the same time as I made the dragonfly wings. I realised when I got them out of my workbox that in the process of tracing I had some how got confused and both wings were actually back to front! I decided to just got with it, there was no way I was going to start embroidering another set! I cut them out rather gingerly as I do worry that the organza will fray and the wings will disintegrate!…they didn’t! The wires from the wings were poked through the fabric to the back and then stitched down. The body is stitched with a stem stitch outline and then lots of french knots in a soft grey/brown thread. The tail and legs were stitched with a green/blue thread to add a bit of colour. So I’ve just got one more diamond and then the lattice framework to highlight…my feet are starting to twitch for a happy dance! This entry was posted in embroidery, Serendipity, Stitch-a-long and tagged Flower Lattice, Silk Ribbon Embroidery, Stumpwork embroidery. Bookmark the permalink. Your work is inspiring. I hope your oranges reach the TV so many others can see your work and the Guild’s also.. Thank you, I’m not sure when the series comes out but I’m sure they will let us know! This is wonderful, those wings are so skilled. Try fray stop if you are worried about them. Thanks Cathy, I might try that another time, put it on before I snip! Thanks Trisha, just one more to do! amazing work as always, especially those tulips with the beads Inside! Thanks Claire, I really like the tulips too, such a simple idea but so effective! wow – it is so beautiful and full of interesting details. I am inspired to try something like this – thank you for highlighting this wonderful craft. 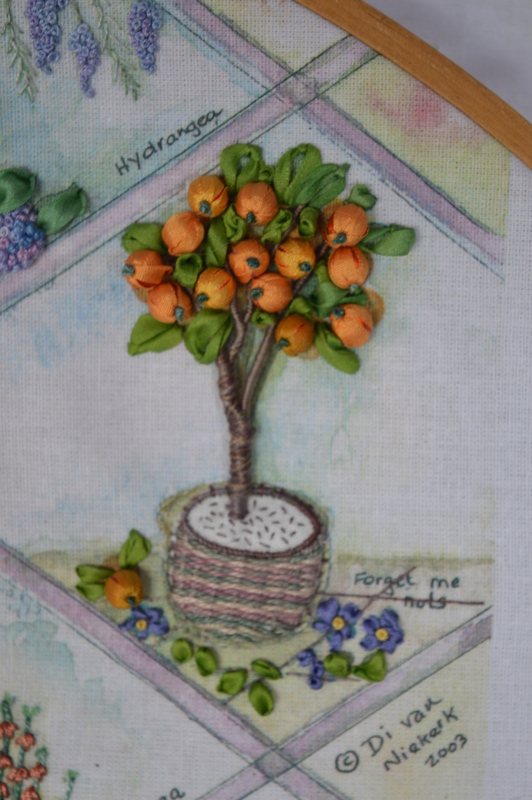 Thank you, I’ve not tried stumpwork before, so it’s been a steep learning curve, try it! This work is so beautiful and perfect I think my brain would explode if I tried it… I know my own limits, I’ll stick with cross stitch and needlepoint! Thanks Kate, I stuck to cross-stitch for years, thinking I can’t do ‘proper’ embroidery, but I pushed myself and to my surprise, I can!! So beautiful and worth the hassle! One teacher I had years ago suggested using pen the same colour as the stitching (like a marker, I can’t remember the brand though sorry),and gently colouring in over those pesky white parts. I also use muslin the same colour (where possible) as the finished piece. Thanks Catherine, I think I’ll try coloured fabric next time, even a soft grey would show as much! Oh my gosh. I love to embroider but stumpwork and ribbon embroidery just take it all to a new level. This is just masterful! These are some of my favorite flowers!! 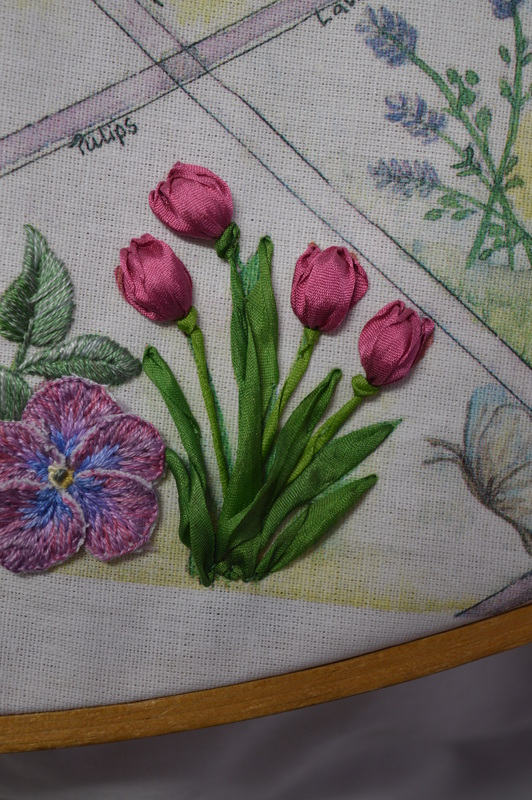 The bead under the tulips gives them such a realistic shape, and the stitching on the pansies is perfect to show off their “faces.” Love the picture of the entire piece thus fall. I see more favorites coming in the final diamond! Wow, your work is gorgeous!! I have a book on stumpwork, and I need to get it out and finally try some. Love the beads and dimensional embellishments on your flowers. Simply stunning. Would a fine felt tip pen or water pencil help with the edges of the petals if you could find a good match? They look absolutely fine from here anyway. Love the tulips! And such a clever idea stitching over a bead. I am speechless. Only one word for this WOW and then WOW again. This is so beautiful. Wow your flowers are amazing! You’ll be finished before you know it. I am amazed by your beautiful work. 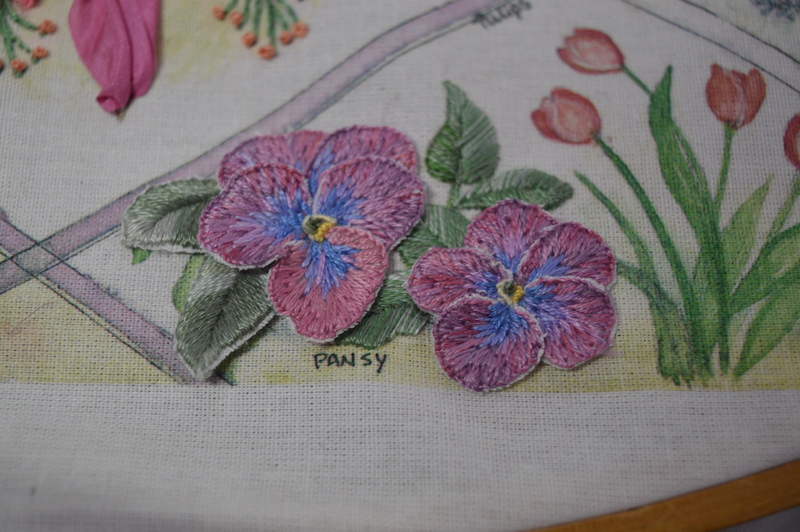 Those Pansy flowers are so beautiful! And the tulip making is genius. The whole diamond turned out lovely. I am amazed every time I see your updates. Beautiful, beautiful work! More beautiful work – very T.V. worthy!! What can I say….more than AHHH, it is so beautiful!!!!!!!! What an amazingly beautiful piece of work you are doing! Gorgeous and inspiring. I bought the book a long time ago but haven’t done a thing with it. As always this stunning piece leaves me breathless. I am utterly mesmerized by it. Holy cow, this just gets more and more impressive every time I see it! It just goes to prove you *can* eat an elephant if you take it bite by bite. I so admire your work.